A collection of short stories featuring the exploits of Sherlock Holmes's grandson. I love how the cover promises "An even greater kick than The Seven-Per-Cent Solution." NOW AT LAST IN CAN BE REVEALED! Recently discovered papers have proved beyond a shadow of a doubt that the great detective Shrlock Holmes has a son. And later, a grandson. The grandson's names was Creighton. From boyhood on, it was Creighton Holmes's ambition to follow in the hallowed footsteps of his illustrious forebear. How brilliantly he succeeded, and what baffling mysteries and stunning solutions filled his casebook, now at last are reveled in adventures that take us back to Baker Street and the eternal war against masters of crime and monsters of evil. 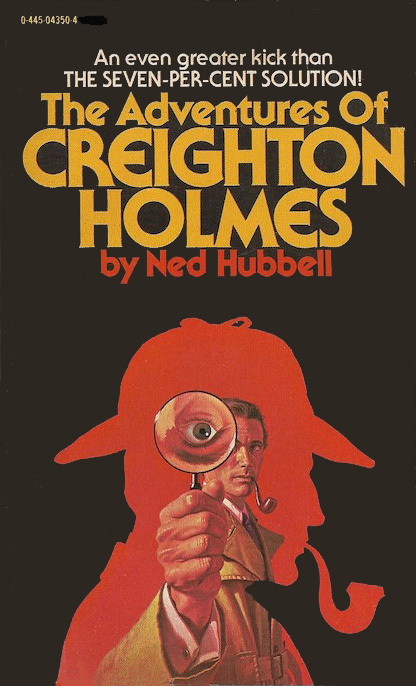 Ned Hubbell actually published this peivately in hardcover (apparently with illustrations by his wife) privately a few years earlier...and did not live to see the paperback published. He was in his 90s. Ah, thank you. I didn't know this.